Bimetal-type temperature control steam traps with a built-in scale removal function. • Suitable for use on interlocking tracers using copper or stainless steel piping/tubing. A bimetal element is used for temperature sensing, and the user is able to set the condensate discharge temperature. Discharges condensate at the desired temperature below the saturation temperature of steam. The sensible heat in the condensate is also used, making it possible to minimize the amount of steam used. The overexpansion mechanism protects the bimetal element from being subjected to excessive force, thereby minimizing deterioration of the bimetal. Condensate discharge temperature is adjustable without disconnecting the trap from the piping. The trap can also be disassembled and reassembled while still installed in the piping. Built-in Scale Removal Function (LEX3N-TZ). Clogs in the valve seat can be eliminated without disassembling the trap. Suitable for steam tracing lines or storage tank coils ONLY IF the required product viscosity will be maintained when the condensate is sub-cooled at least 15 °C (27°F), even to the point of the condensate having a lower temperature than the product temperature. Suitable for use on instrument enclosures ONLY IF the steam or condensate temperature in the enclosures will NOT damage the instrument. 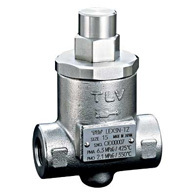 Suitable for use as an external air vent for TLV steam traps, or as a non-freeze valve for freeze protection of condensate lines.